← “The Wizard’s Chamber” on The Melting Potcast! I’m pleased to announce the next Freelance Hunters project, a novel-length serial, has launched on Patreon! Patrons who donate a dollar or more will get access to the first Freelance Hunters novel, with new chapters appearing weekly! 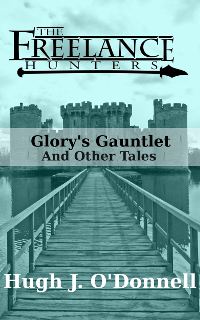 Non-patrons will have to wait until spring for the eBook and print launch, but there will be new Freelance Hunters short fiction for your eyes and ears soon. But until then, enjoy… The Shadow Over Ironwood! When Glory and Joachim save an Elf girl from an angry mob, she begs them to save her logging village, located in the mysterious Elven homeland of Ironwood Forest. But the Forest is a deadly maze of traps and magical creatures which no trespasser has escaped alive. Can the two of them make it out alive, much less save the day? And where the heck is Bingo? This entry was posted in Promo and tagged Novel, Patreon, The Freelance Hunters, The Shadow Over Ironwood. Bookmark the permalink.